Based on elements of Karate, Kung Fu, and Jiu-Jitsu, Kempo is a martial art that is both progressive and traditional . It combines striking and kicking techniques with grappling, locking, and throwing skills to form a complete self-defense system. The atmosphere in class is relaxed yet focused, with an emphasis on each student learning and progressing at their own individual pace. Instructors lead workouts with energy and compassion, encouraging students to work at their own pace, while motivating them to do their best. Kempo-Jujitsu is a practical, scientific method of self-defense, as well as a natural and effective form of exercise for relaxation, toning, and weight control. Students will learn practical and effective self-defense techniques, get in great physical shape, and have a lot of fun. 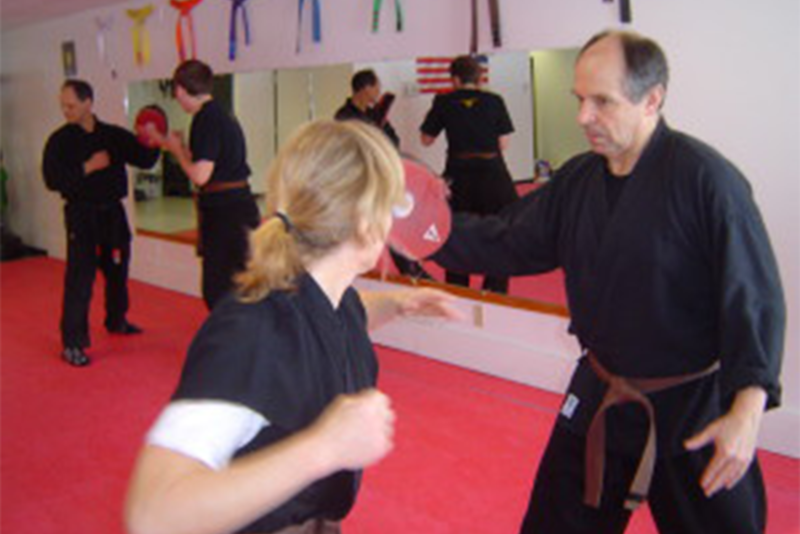 Martial arts is a fascinating hobby and a great way to meet a variety of interesting people. Our program keeps high standards for ability, professionalism, and student service. Check out our schedules for dates and times. Click HERE for more information or a FREE trial of our Kempo-Jujitsu class. Brazilian Jiu-Jitsu is considered by many to be the ultimate grappling art; its practitioners have received worldwide acclaim for their success in mixed martial arts competition. Now the fastest-growing martial art in the world, Brazilian Jiu-Jitsu owes it’s popularity to its practicality. Students of this art learn in a straightforward, hands-on way that develops skill and confidence after just a few classes. 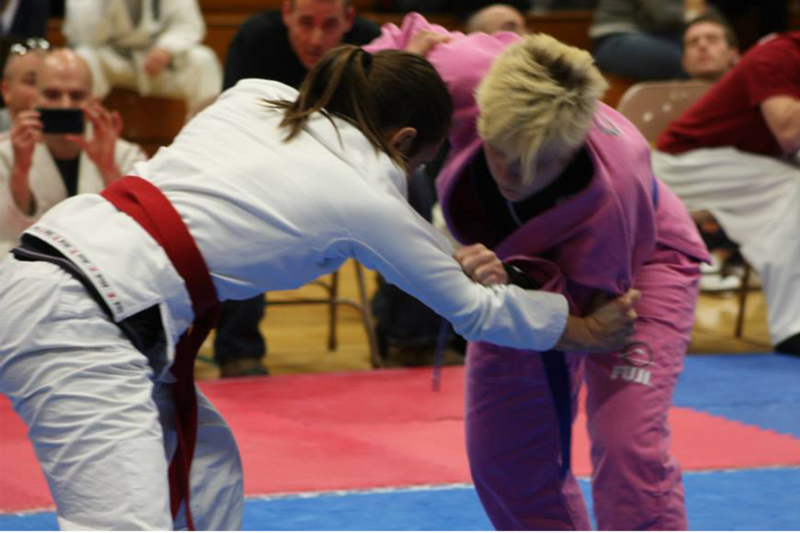 Practice focuses mainly on repetitions of sequences of Jiu-Jitsu techniques. There is little time spent on calisthenics; after a brief warm-up, the students get their exercise by performing the moves. The techniques are taught singly at first and then built into a practice sequence that encourages a natural flow of technical options. The class is taught in a non-competitive way, but Jiu-Jitsu offers a great opportunity for competition for those who desire it. Brazilian Jiu-Jitsu is an excellent form of exercise for strength, flexibility, and weight control, potentially a sport for competition, and a fascinating and sophisticated martial art. Beginners and experienced martial artists alike will be amazed at how fast the techniques can be learned and how quickly they will develop practical skills. Check out our schedules for dates and times. Click HERE for more information or a FREE trial of our Brazilian Jiu-Jitsu class. 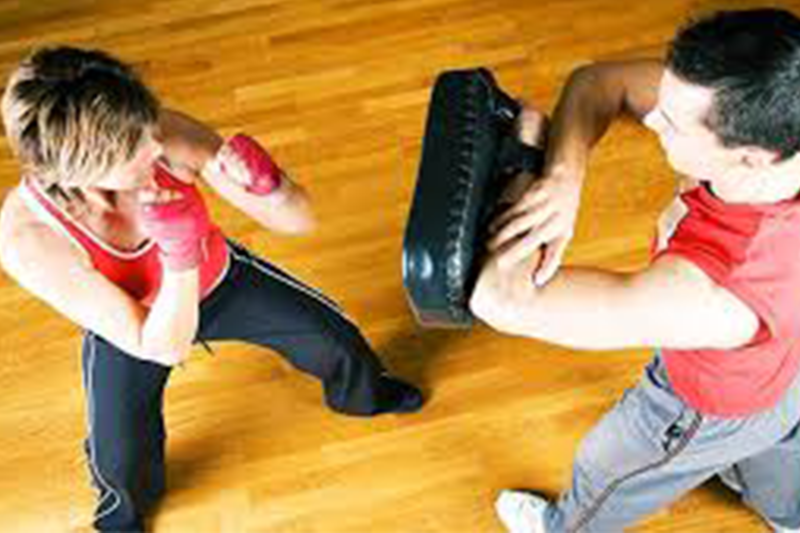 Self-Defense class covers the required skills for Kempo and MMA and is open to Kempo and MMA members (ages 15 and up) and to new students who may simply be interested in the basics of self-defense. The class is taught in a safe, relaxed and informal atmosphere. Beginners are welcome. Great exercise along with learning simple but effective self-defense skills. Check out our schedules for dates and times. Tai Chi is a gentle form of martial arts that combines deep diaphragmatic breathing and flowing poses, and is a potent workout for people of many ages. Although this low-impact martial art is slow and doesn’t leave you breathless, the benefits of Tai Chi address the key components of fitness–muscle strength, flexibility, balance, and, to a lesser degree, aerobic conditioning–as well as provide an overall stress-relieving form of exercise. Check out our schedules for dates and times. Click HERE for more information or a FREE trial of our Tai Chi class. Wing Chun Kung Fu is a traditional Chinese art that emphasizes close-quarter self-defense. Training focusses on a relatively small number of techniques and principles which can be combined in a vast number of self-defense combinations. Exertion is light to moderate. Wing Chun, the first martial art studied by the late Bruce Lee, is based on centerline control, contact sensitivity, simultaneous blocking and attacking, and trapping and striking. The style consists of just three simple empty hand forms, or routines, and the mook jong, or wooden dummy form. 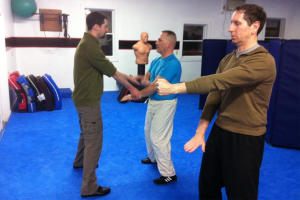 Emphasis in class is on practicing the drills with a partner in order to develop the lightning hand speed and precision characteristic of Wing Chun. Wing Chun is a simple style and can be mastered in a relatively short period of time. It requires relatively little size or strength, and thus is a practical self-defense system. Check out our schedules for dates and times. 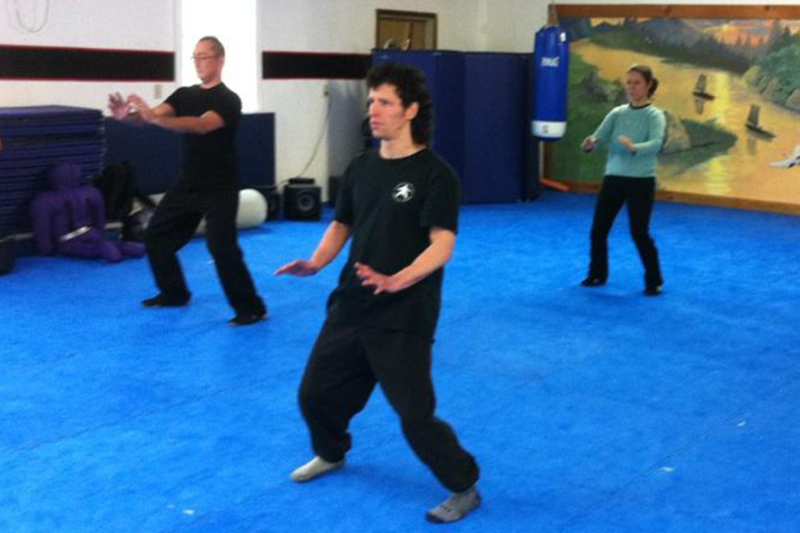 Click HERE for more information a FREE trial of our Wing Chun Kung Fu class. Arnis de Mano is a weapon and empty-hand style from the Philippines. 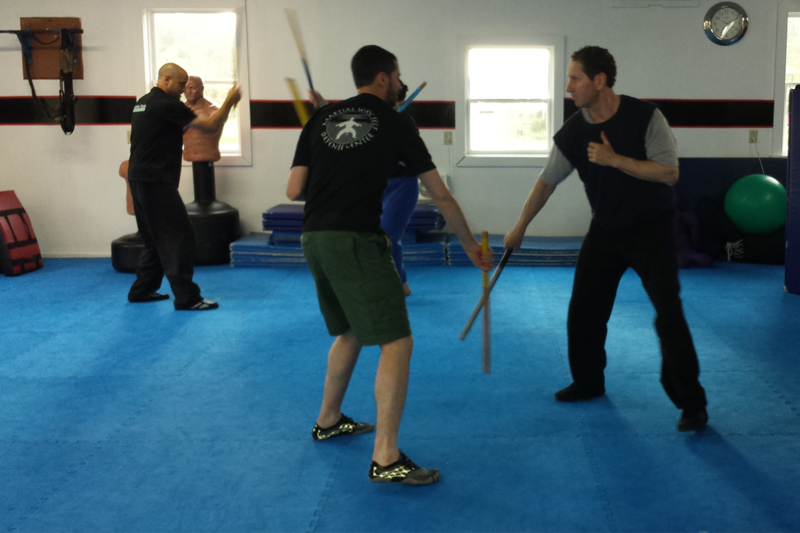 Utilizing 26-inch rattan canes and safety-edged bladed weapons, Arnis classes are fast-moving and fun. Exertion is light to moderate. The style of the late Grandmaster Remy Presas, Modern Arnis is a blend of Filippinio styles, Karate and Ju-Jitsu. Unlike other weapon styles in which the student trains empty-handed and eventually “graduates” to weapons,Arnis practitioners first learn the use of the weapons and later learn the empty-handed applications. The style is characterized by lightning quick and beautifully flowing movements of the canes interspersed with trapping, locking, and controlling techniques with the cane and empty hand. There is little class time spent on calisthenics; students warmup with a progression of techniques and footwork. Arnis is an extremely practical weapon art because, unlike other weapon styles which cannot be utilized without the weapon,the techniques of arnis apply with or without the weapon. It is an interesting hobby and a good form of light to moderate exercise. It is a flashy and fun activity with a fascinating history. Check out our schedules for dates and times. Click HERE for more information or a FREE trial of our Arnis de Mano class. This program teaches a practical and common-sense approach to personal protection for women in a short amount of time and training. Simple, effective physical techniques are combined with vital tactical and strategic training designed to help prevent the need for the use of physical skills. Exertion is minimal to light. Research has shown that attackers will exhibit certain behaviors and look for certain traits in their victims. ThinkSafe teaches both how to project an image of non-vulnerability and how to perceive and deter potential attacks before they become physical. In the event of a physical attack, ThinkSafe techniques are simple and practical, designed to achieve maximum effect with a minimal amount of training. Since the schedule for ThinkSafe classes varies, please contact us about future trainings or about scheduling a custom workshop for you or your organization. Martial Way also recommends women self-defense trainings with The Safety Team, a non-profit organization comprised of seven highly-skilled women martial artists. This team has participated in Martial Way’s ThinkSafe Self-Defense Program, first as students and later as instructors. They have also earned black belt rank with Martial Way in Kempo-Jujitsu and Arnis de Mano and advance rank in Brazilian Jiu-Jitsu and Bushintai-Do. Visit their website to learn more about The Safety Team and their self-defense workshops or email Christine DiBlasio, Program Director, directly at Christine@TheSafetyTeam.org. Click HERE to request information about our ThinkSafe for Women Program. This simple and practical self-defense program for men teaches basic, effective physical skills, as well as the mental and strategic techniques of self-defense. The schedule and format vary from a one to a six-hour presentation. Exertion levels vary and can be tailored to a particular group or individual. Men tend to face different types of aggression than women. ThinkSafe teaches the strategic and tactical skills men need to detect potential aggressors, deter the attack whenever possible, and defend themselves, if necessary. There are no complicated moves to learn, no belts or uniforms, only practical and effective self-defense skills. The ThinkSafe program offers men a high level of personal protection skill in a short amount of time and training. Please contact us about future trainings or about scheduling a ThinkSafe session that is tailored to you or your organization. Click HERE to request information about our ThinkSafe for Men Program. Since the Summer of 2003, Martial Way has offered a 3-day weekend martial arts camp for adult Kempo-Jujitsu and Brazilian Jiu-Jitsu students. 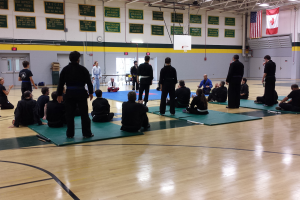 Hosted at Lyndon State College in Lyndon, Vermont, this camp offers a chance for total immersion in Kempo-Jujitsu, Brazilian Jiu-Jitsu, or some of both–as well as the opportunity to participate in a variety martial arts seminars. Past seminars have included hand-gun disarm training, side-arm or straight baton training, functional conditioning for the combat athlete, and Arnis. In addition to this intensive martial arts training, Martial Way’s adult Kempo-Jujitsu and Brazilian Jiu-Jitsu tests run concurrently and add to the overall celebration of the martial arts. Weekend Camp 2018 is scheduled for August 3, 4 and 5, beginning Friday afternoon through Sunday afternoon. 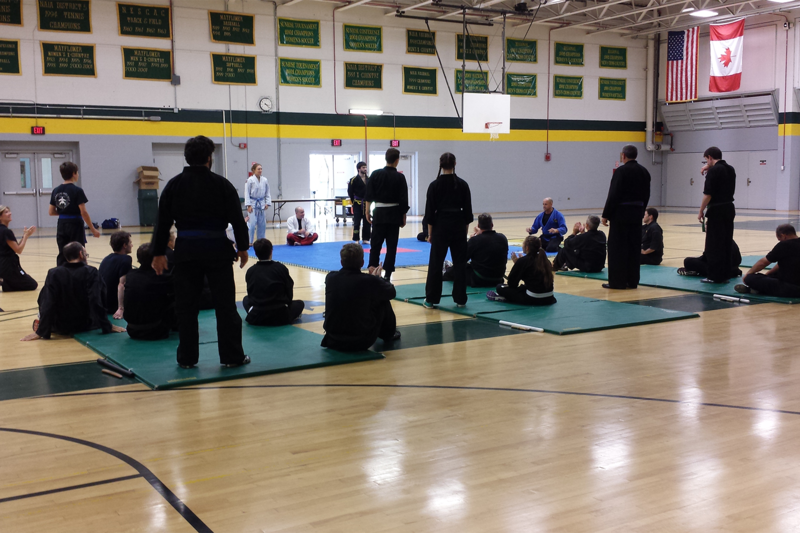 Click HERE to request information about our Martial Arts Weekend Camp for adults.